Caulk is an inexpensive product ideal for filling in gaps and providing your shower with a finished look. 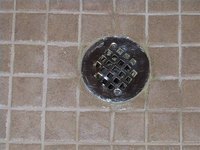 When applied to a shower drain, it will help keep water from seeping into areas where it should not go. Select kitchen and bath or silicone caulk for a shower drain, as these types are designed for areas with a lot of moisture. All it takes is a bead or two of caulk using your caulk gun, so if you are comfortable using a caulk gun then caulking your drain should be a breeze. Remove your shower drain basket by unscrewing both screws located on either side of your shower drain. If you are planning on reusing this shower drain, scrub it clean and make sure all soap scum has been removed. Flip the shower drain upside down. Apply a bead of kitchen and bath or silicone caulk around the underside of the drain. Create a bead by pressing the caulk gun firmly against the drain basket underside, and pushing the gun forward while keeping it an an angle. Place the drain basket back into the drain fitting and use your screwdrivers to tighten the screws. Place another bead of caulk around the edge of the shower drain, and use a moist paper towel to wipe any excess. Allow caulk to dry for 24 hours before using the shower. You can also apply caulk using your finger, but make sure to wear snug fitting latex gloves to do the job. Just wet the gloved fingertip, and use this to create your beading effect. For best results, you should wait until the shower stall, including the walls and floor are completely dry before you begin to caulk. If there is moisture in the area the caulk may not affix as well and will be likely to peel off.